The 32 metre sportfish yacht Polo V, listed for sale by John Weller at Northrop & Johnson, is sold with David Gennett at Camper & Nicholsons introducing the buyer. Polo V was built in aluminium by US shipyard Broward with exterior styling by Luiz de Basto and was delivered in 2004 with a recent series of upgrades. Her interior is in hand rubbed cherry wood with burl accents but the signature feature is a spiral stairway enclosed in curved glass going from the main deck through the sky lounge and on up to the flybridge. She accommodates eight guests in four staterooms consisting of a master suite and a VIP suite with queen sized bed plus a double and a twin cabin. All cabins have en suite bathroom facilities while twin 2,000hp Detroit Diesel engines give her a cruising speed of 24 knots. 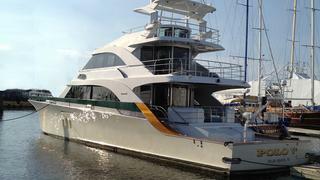 Lying in Fort Lauderdale, Florida, Polo V was asking $2.6 million.